There are a few par fives that only a long hitter can reach in two, and even then that long hitter has to crush two shots back to back. In such situations, I love to hit my driver 'off the deck' (i.e., off the turf) for my second shot. It's not as tough as it seems, particularly with today's generation of low-profile metal woods. But before you consider this shot, take a hard look at your lie. The ball doesn't have to be in the fairway. Indeed, if you have a tight lie, you may not want to hit it with the driver. But if the ball is sitting up, in either the fairway or light rough, so that at least part of it is higher than the top of your clubface, then you have an opportunity to go for it. Control is Important, so grip down Just a hair - this will help ensure against a fat shot. 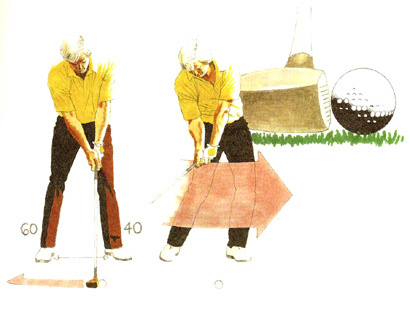 On the other hand, you don't want to swing above the ball and thin it, so put a bit of extra flex in your knees. The most Important element of this swing is a smooth, long takeaway in which you keep the clubhead low to the ground. If you can take the club back this way, you'll have a good chance of returning it smack into the back of the ball for a clean, strong hit. So widen your stance a bit by moving your right foot back (keeping the ball in its usual position in your stance). As you widen your stance in this way, you'll tend to add a bit more weight to your right side so that instead of a 50-50 distribution it will be 60-40 in favour of the right. This adjustment will set you up for that long, low takeaway. Don't worry about any other adjustments. Simply trust your swing, trust your lie, and trust your driver to do the work. Remember that you have a powerful club in your hand and clean contact is all you want - you don't need to attack the ball. Quite the contrary, on the downswing you should feel as if your upper body is hanging back as your legs drive through impact. If you can stay behind this ball, you'll have the best chance of pushing it forward.